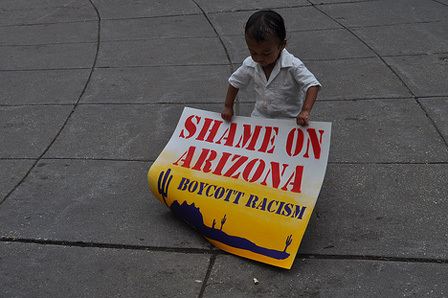 Join T4SJ, as a proud member of a national network of Teacher Activist Groups (TAG), in standing in solidarity with teachers and students from the banned Mexican American Studies (MAS) program in Arizona. Show your support by teaching lessons from and about MAS in the month of February. Learn more at No History Is Illegal! Teacher Activist Groups (TAG) believes that education is essential to the preservation of civil and human rights and is a tool for human liberation. In alignment with these beliefs, TAG is proud to coordinate No History is Illegal, a month of solidarity work in support of Tucson’s Mexican American Studies (MAS) Program. In January, 2011, state attorney general Tom Horne declared the Tucson Unified School District MAS program illegal. Over the past year, teachers, students, and administrators have come together to challenge Horne’s ruling, but on January 10, 2012, the TUSD school board voted 4-1 to cease all MAS classes immediately for fear of losing state funding. * For our May 9th, 2012 No History Is Illegal forum, click here.